Just wanted to make sure we were all informed about the break, meets, and parents day. Girls will be wearing a blue leo with black shorts. The set is $51.00. Sorry for the price increase this year but GK is no longer giving discounts for small orders. I’m considering jeweling them to dress them up a bit. Let me know what you think. This would add another 10-15.00 to the outfit. Used ones are available at the gym so please check there first. Boys will be wearing a black Hanes Tank top and Navy Blue Hanes shorts. The total price is 25.00 if I can order it all together. If separate you have to pay additional for shipping. I would like to get the boys a more professional shirt to match the girls but we are just starting out and I want everyone to get a feel for how much fun this is. We’ll keep that in mind for next year. Please get your fees in on time so I can place the order and get the outfits here in time for competition. So please let me know so I can get you on the list. They have all started learning routines and should be ready to compete. Yes, we are going to host a gymnastics meet for levels 1,2, and Tops. Coach Lettie and I will be judging and our other coaches will be leading the kids through there events. Every kid will receive a ribbon for participating and get the chance to see what a competition is all about. Please, don’t miss out on this event. The kids are looking forward to getting scores for there routines. This is also there final evaluation before we move them to the next level. Class times will not change for anyone, it just means we’ll get to work on the next level higher for each class. So level 1’s will stay in the same class and time but work on level 2 skills and routines. You may opt to go twice a week starting in January for level 1’s if you can swing it. More time in the gym means more time developing. What to wear: Wear there nicest, best fitting leo, with shorts. Hair should be pulled back and completely out of face. Please do a fun cute hair do. No jewelry or nail polish. We have belts! The kids should have brought home a belt in the last two weeks. Please have them wear the belt to class every time. We will be doing testing for next level up belts bi-anually. The next level up will not always be given. They must prove certain competencies and knowledge. December 10th’s Critque Meet went very well. 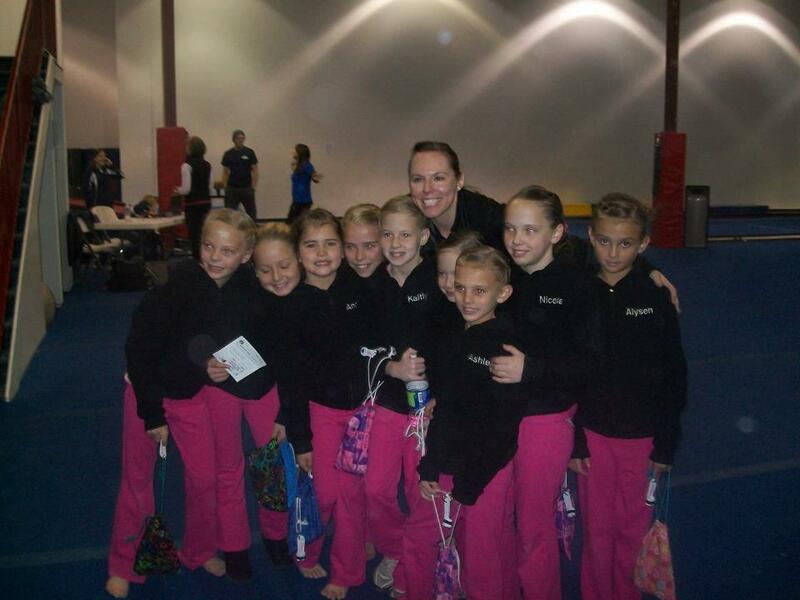 This was the first competition our Xcel group went to. So for most of the girls it was there first “real” competition. They were excited and could hardly contain themselves. They were very respectful and responsible. I feel they conducted themselves well. You all came prepared and to followed the requirements for hair-dos. I did see some underwear sticking out that wasn’t black however on a few of the girls. Please check for that before the next meet. A few of the girls blanked a little on floor, which is to be expected at a first meet. It’s hard to orient yourself when you are in a new gym set up. They’ll remember to pay more attention I think to there routines now that they know the pressure of going to a new gym. I’m so glad we went to this because it put some perspective on the subject of competition for you (parents) and the athletes. Other than those few things (underwear and routine orientation) I think it went better than expected! One of our girls placed 3rd All around out of 45 competitors. They just lumped all the scores together since they weren’t handing out medals. I think this is fantastic considering it’s the first meet! I had lots of nice compliments from the parents about the meet that I wanted to post. One put me to tears so I thought I would share it. Thank you all so much for your support. It means so much to us at Big Rock. I just thought I would take a minute and tell you about our experience today. This was Anna’s first time in another gym and she was so nervous! I thought they did a great job and I was super proud to tell the other parents that we were there with BIG ROCK! I am especially glad that you had us get the warm ups. They did need them. I personally liked ours the best simply because they had the girls’ names on them so again thank you for going the extra mile to make that happen. We had a great time. Anna talked about her teammates and how much fun that was all the way home. We are excited for the next one and just wanted you to know how much we appreciate all of your hard work! We know that this is a comparatively small group and that it’s tough to feel like you are keeping up with the other gyms. For the record, I think they held their own. Don’t give up on us! This is a great gym, and a great program. We love and appreciate you! Exciting New Class Monday Nights! This is a night of learning fun hard tricks and deep down conditioning. 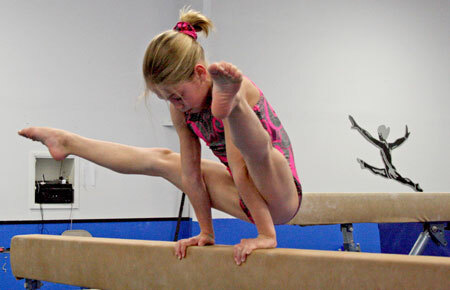 Want to get the back walkover on the high beam or cast handstand on the bars? This program is a new program that we are going to open up to JUNIOR OLYMPIC TEAM, TOPS, XCEL TEAM and higher level tumblers. It will focus on strength, flexibility and learning the skills that are ABOVE your athletes level. It’s a class all it’s own that we will compete with. It’s not a standard gymnastics class. We’ll be following a strict guideline of workout methods that have been proven to help kids progress faster than ever! This is to be used as a complimentary class in conjunction with another class or other sport. For example it will see if you can hold a handstand for 30 sec. and do twenty straight leg leg lifts. The State tests are conducted in the summer time at Arete Gymnastics once a year (so it’s not a huge commitment when it comes time to test). If your child ranks well they could move on to regional and national competitions in TEXAS! Kids that do this extra program are sure to progress faster and be stronger than the kids who don’t. Level 6 kids and up are required to take this class but it’s optional for level 5 and lower. Why not get ahead of the game and learn some great skills in the mean time. I’m confident that this program will boost your child’s confidence, strength and ability . We are modeling a program that Arete Gymnastics has used for many years with great success! They are one of the top elite gyms in the country and we are lucky that they share there knowledge and information with us so that we can have the same success they’ve had. What does this mean for our Junior Olympic Team girls? It means that Monday is optional now and it also allows other kids to workout right along side our Junior Olympic kids. Regular practice nights for Junior Olympics will now be only Wednesday and Fridays at the regular times. Optionals Night Monday will not be able to be used as a makeup day unfortunately. You’ll need to be signed up for Monday’s in order to participate. Punch passes will only be made available to those who live 1/2 hour away or more. But you all realize that the more you come to this class, the more the benefit. We can only get an athlete better if they come on a regular basis. At minimum two times a month. So please use a punch pass as a last resort. So what does this do to our tuition? Junior Olympic will now be 98.00 a month. If adding the optionals day it will stay at 120.00 a month. So that means if TOPS, XCEL, or POWER TUMBLING kids want to come in Mondays, they can. Below are our rates if you would like to add the additional day to your schedule. or $130.00 for 8 classes if you don’t have another class at the gym. Parents, when you look at it, it’s not much more money for such a huge impact it will make on your child’s training.